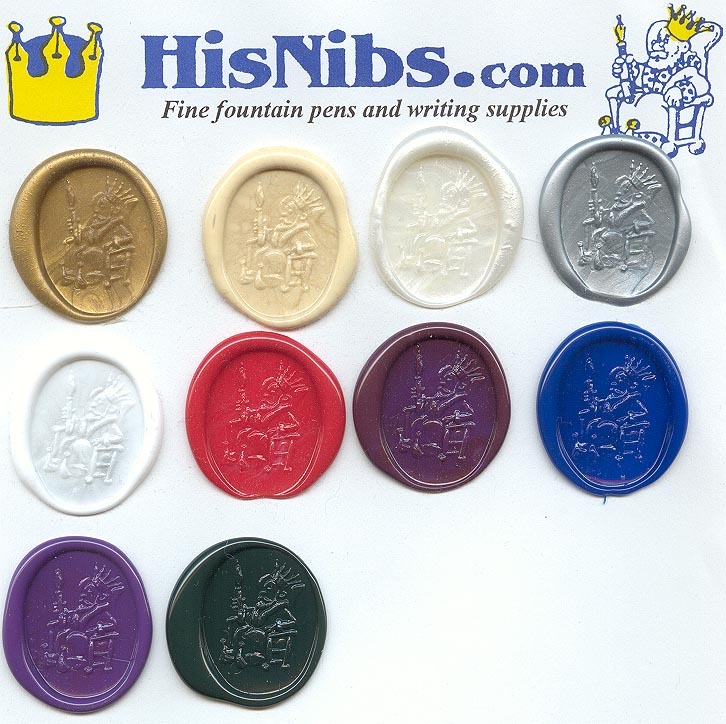 So many customers have admired the sealed notes that I include with my orders -- and wondered about the sealing wax I used -- that I decided to offer the supplies to others. The secret to the flexible seals which I use is that they're not wax at all, but rather faux wax -- a type of glue. Not only do they avoid the brittleness and crumbling problems of regular wax, but you no longer have to struggle with alcohol lamps, candles, melting cups, dripping hot wax, burnt wax or any of the other hassles and dangers of working with an open flame or near-boiling temperatures -- because faux wax is applied with a glue gun! I struggled for some time with the time-consuming, and potentially dangerous process of applying hot wax to notes and envelopes -- burning and discoloring the wax more often than not -- until I found this clean and simple method of achieving the same, or should I say better method using faux wax. Not only does the glue make for a superior sealed impression, but the choice of colors is almost unlimited. Instead of the time-consuming process of heating, pouring, stamping and then heating again for the next seal, simply place the faux wax in the glue gun and squeeze the trigger, then impress the seal and you're ready instantly for the next one! As each squeeze of the trigger releases a consistent amount of faux wax, there's no waste and the resulting seal solidifies very quickly -- leaving a non-brittle, very flexible seal which in my experience even travels through most postal machines without damage (how many successful wax seals arrive unscathed?). Available in a rainbow of colors -- including neon and glitter. The number of seals you get from one stick is totally dependent on the size of your seal, but 5-10 from the mini sticks is a pretty good guide for most of them. The signet ring that I use for my seals is quite large, so I'm closer to the smaller number. Note: click here to read the simple procedure that I follow to make my own seals. 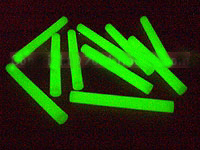 HNS-154 Glow In The Dark colored glue sticks! These sticks will emit a brilliant green glow for some eerie special effects! Especially useful for Halloween projects. For use in either High or Low Temperature glue guns. Non-Toxic. 1/4" dia. x 4" long mini. HNS-150 Standard Glue sticks in many assorted Standard Colors! For use in either High or Low Temperature glue guns. Popular for a variety of hobby & crafts type projects, kid's projects, etc. Non-Toxic (colors may vary depending upon what is in stock). 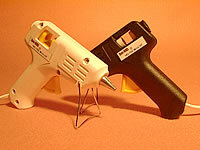 Mini-Stick (5/16" sticks) Glue Gun for light duty hobby & craft use. Compact size is ideal for working in close quarters. The first step is to insert the colored glue stick into glue gun and plug it in. You'll initially need to wait a few minutes for the gun to come up to temperature and begin to melt the faux wax. You'll know it's ready when a bead of liquid glue forms at the tip of the nozzle. The whole secret of preventing the sealer -- such as a signet ring -- from adhering to the faux wax is a temperature differential. Just put a couple of ice cubes in a small bowl and then lay the ring or seal on the ice. When the glue gun is up to temperature (on the dual-temperature gun, use the higher temperature setting for the best results on paper and envelopes -- the lower temperature setting of the gun can be used on more delicate surfaces, such as tissue paper) squeeze the desired quantity of faux wax onto the surface that you're sealing, take the chilled seal and press it onto a paper towel or kitchen towel to remove any moisture from the seal. Press the chilled seal firmly into the glue, then remove (you only need to press it for a couple of seconds). Chilling the seal after each impression will help the seal to release from the glue quickly and easily once you press it into the hot glue. If the seal becomes too warm while you are making the seals, it will stick in the glue and not make a very clear impression. You'll want to experiment a few times to determine the proper amount of glue to squeeze out for your particular seal, but it's actually quite a small amount -- as it spreads under the pressure of your impression. I've found with the large, dual-temperature glue gun, that with my large seal about 1/2 squeeze of the trigger releases enough of the glue.